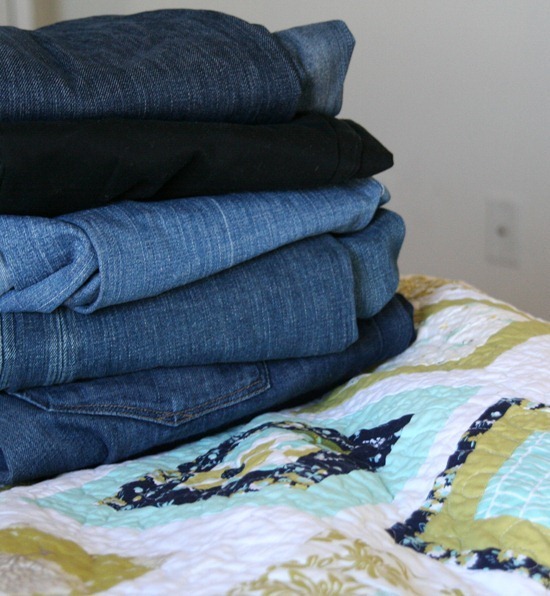 This quilt has been done for about a month and I am just now getting photos on and posted….talk about a crazy (fun!) month we’ve had. Plus it’s been sitting in the back of my car since the Sewing Summit and I forgot it was back there (shameful). I quilted this with an all-over loopy pattern, and did the borders in a wavy back and forth pattern…not like you can see it but hey…it’s there. This one was made with a Ruby layer cake (here, here, here, here, here, or here…so basically almost everywhere) and pattern (here, here or here…in hard copy or PDF). And in other news…I dug out my maternity jeans today (aka stretchy pants). I was just deciding how to quilt my latest quilt, and thinking of loops like this but nervous about how to really do it. So nice to see an example! Congrats on the pregnancy! I have ~7 weeks to go and my maternity pants are starting to not fit. My 2-year-old's name is Ben, too. Love your blog! What a gorgeous quilt! I love the loopy loop quilting…really works! Beautiful quilt! I love your style. 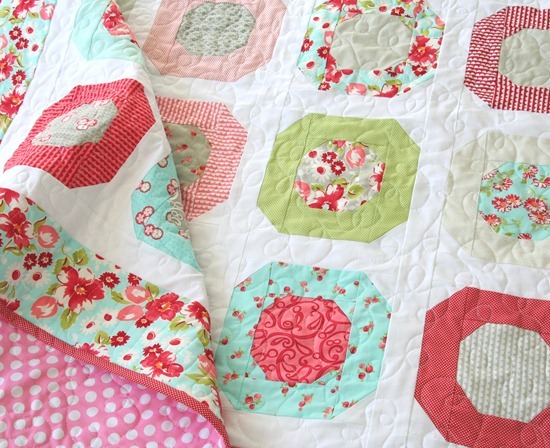 I think this is the most perfect Ruby quilt I've seen…YUM! Just lovely. Ruby is awesome. I love the quilt, very pretty! I'm in exactly the same place on the way back down… after my first baby my jeans are little too tight but pregnancy clothes just won't stay up! I love that collection of fabric. So pretty! great looking quilt. Beautiful colours. Oh my, I love this! I makes me want to do those colors in my daughter's room, so cute!!! It is so beautiful! I love the Ruby fabrics!! They are so happy and cheerful to look at. Beautiful! I love the fabrics. My daughters used a maternity 'belly band' when their regular pants started getting tight. They could undo the button/zipper and put the band over top the pant top and they would stay up!! So so so pretty!! you leave that in the back of your car, really?!! 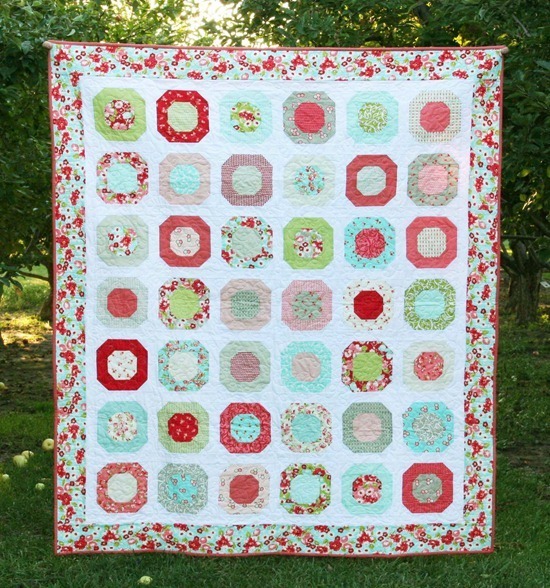 such a cute quilt, especially with that line of fabric! wow – i love this! gorgeous! Love the quilt! Dude, I've the maternity jeans out since wk 11. But you saw my bump making an early appearance at the Summit. Good for you for holding out this long! After all, we'll want to burn those pants at the end right? That quilt is adorable! Do you do your own quilting on it, or send them out? I just Love this Quilt!! the colors and pattern are so refreshing!!! My daughter is at the same phase, to do or not to do maternity jeans. Gorgeous! I am rethinking my aversion to using white! I love, love, love this! I am right there with you. I tried maternity pants on this week and was overjoyed that they no where near fit! But I can't get my regular jeans up, so I guess I am living in leggings and sweats for a few weeks! Congrats on your little one on the way! Love your quilt! The colors are just beautiful and the quilt jumps off the page! Well done! As far as maternity wear, it's been 23 and 29 years for me…in the old days, we all hid our baby bellies…nice to see celebration of the baby bellies these days! Beautiful quilt. I love your choice of fabrics. Congrats! I loved this quilt when I saw it at the Sewing Summit! So cute! And I was so glad to meet you! I'm thinking I need to make some hourglass blocks! love this quilt – hope its going to be a pattern ! I've been thinking about making my first quilt for a couple of years now but haven't had the guts. Now that I have a new sewing machine, I'm ready to try. Can you recommend any good patterns for beginners? I like the idea of a stripe one but not sure if that's hard? Also what kind of top-stitching would you suggest on a stripe quilt?